What did Orwell write about Facebook? OK, where do we start on this fortnight of bad karma for the local football club? 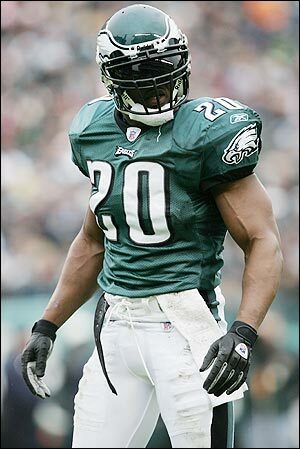 First the Eagles allowed Brian Dawkins - one of the top three most popular players in franchise history - to sign with Denver without so much as a token PR countermove to quell the overwhelming fan dischord. Then Lito Sheppard was dealt for a fifth-round pick. Wide receiver Greg Lewis was dealt, too, though that one isn't much to get all worked up over. Still, in 43 Super Bowls, there is only one Eagle wide receiver to catch a touchdown pass and that receiver is Greg Lewis. Meanwhile, cornerback Shawn Springs was brought in for a visit and trotted out before the local media only to sign with the Patriots. No worries there, either. The Eagles signed safety Sean Jones a couple of days later. The biggest one might have come on Monday when Tra Thomas signed with Jacksonville. If Thomas didn't make it back to the fold, perhaps Jon Runyan will find work elsewhere next year, too. But then things really started to get weird... like weirder than allowing Dawkins to split town without so much as lift to the airport or a hearty handshake to say, "Thanks for making us look good for 13 years." Late last week the social advocacy group ACORN protested in front of owner Jeffrey Lurie's Main Line home. The telling part about that was not that the group claimed the team owed the city of Philadelphia $8 million in shared revenues from luxury boxes in a stadium that was blown to bits five years ago. Instead, it was odd that a group with ties to progressive politicians and social advocacy would target Lurie, who seems to have carved out a place for himself in the Democratic party and folks with ties to the group. It sounded as if the groups Lurie wants to bind himself to are protesting. But maybe that's oversimplifying it a bit. However, today, our friend John Gonzalez wrote a story for the Inquirer in which he tells the tale of Dan Leone, a game-day employee for the Eagles who was fired from his job for lamenting the departure of Dawkins on his Facebook page. Seriously, Facebook. A social-media web site filled with jokes, silly pictures and friends having some not-so private private conversations. Besides, the Eagles definitely have had worse seeds drawing a paycheck. Look at T.O. I never met either man, but I'll go out on a limb and say Leone is no Terrell Owens. Anyway, Gonz's was picked up on some well-known web sites and blogs and the consensus seems to be that the Eagles can do whatever they want. Leone is a seasonal, at-will employee without much recourse if the team wants to tell him to go away. It stinks and it's cold-hearted, but that's the way it is sometimes. It's especially head-shaking when the fact that Leone is handicapped with a neurological disorder called transverse myelitis and works with the aid of a wheelchair. Not that his condition had anything to do with Leone's job performance or activities away from work. On one hand, you have a lifelong Eagles fan who not unlike so many others was crushed by the departure and simply made an emotional comment. Unfortunately, he fell into the technology's trap, utilizing politically incorrect terms in a public forum and associating it with his employer. Still... Facebook? Seriously? Wow. If people get fired from jobs because of what they put on their social-media pages, the unemployment rate in the country would be 95 percent. C'mon... it's not like he tried to sneak a hoagie into the stadium -- oh yeah, people can do that now. Never mind. The odd part, of course, is in an age where anyone with an opinion can create a blog, post on a message board, call in to a radio station or protest in front of the owner's mansion, why is it that the guy in wheelchair with a knee-jerk status update on Facebook gets the axe. In the interest of full disclosure, I'm in the process of stripping any color, vim or verve from my Facebook page. Heck, if Leone isn't allowed to have a personality and a job at the same time, maybe a little sacrifice is OK. I'll still be your friend though. Besides, Facebook is so 2007.